Hispanic immigrants are more than twice as likely to not have health insurance as Hispanics born in the U.S., according figures recently released by the Census Bureau. This year, one-in-four (25%) Hispanics lack health insurance, the highest rate of any racial or ethnic group, according to the Current Population Survey’s March 2014 Annual Social and Economic Supplement. About 14% of the general U.S. population is uninsured. By contrast, among Hispanics without health insurance, 7 million are immigrants and 6 million are U.S. born. Four-in-ten (39%) Hispanic immigrants lack health insurance compared with 17% of U.S.-born Hispanics. The share is even higher among those without citizenship. 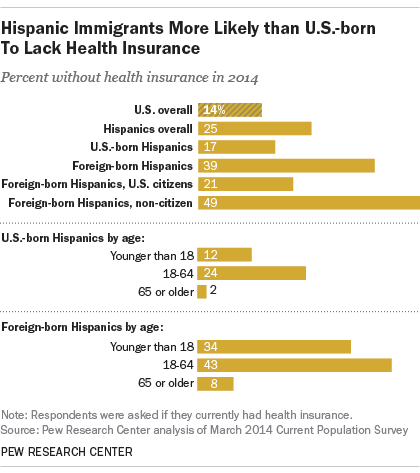 Nearly half (49%) of Hispanic immigrants who are not U.S. citizens lack health insurance. Latinos make up the majority (56%) of the nation’s non-citizen immigrants, and many of them are in the country illegally. Looking at health insurance coverage by age, the group of Hispanics most likely to be uninsured are immigrant adults of working age — 43% of Hispanic immigrants ages 18-64 say they lack health insurance. Among Hispanic children, more than one-third (34%) of immigrants ages 18 or under are uninsured, compared with 12% of Hispanics born in the U.S. About 9% of all children in the U.S. don’t have health insurance. The Current Population Survey measures coverage shortly after this year’s health insurance expansion under the Affordable Care Act. However, comparisons to prior years are not possible because the data comes from a new survey question implemented by the Census Bureau. A Pew Research Center survey this spring found support for the Affordable Care Act had declined among Hispanics. In March, Hispanics were evenly divided on the issue, with 47% approving of the law and 47% opposing it. Six months earlier, approval was at 61%. Health care has consistently ranked as a top issue for Hispanics. In 2013, 41% of Latino adults said the issue was an “extremely important” issue facing the country today. Only the economy and education ranked higher, whereas the federal government debt and immigration ranked lower.